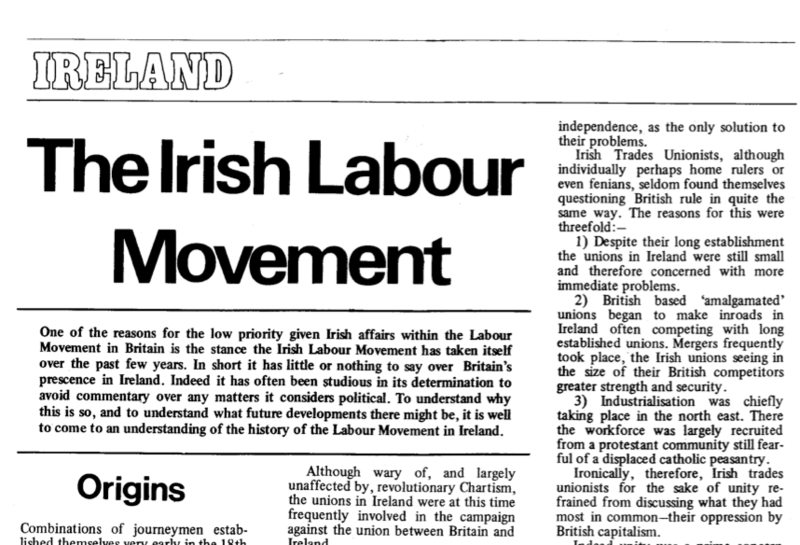 Following on from Tony Zebrugg’s piece on British anarchists and Ireland in the 1970s, here is an article about the Irish labour movement and partition from Libertarian Communist (the magazine of the British Libertarian Communist Group) in 1980. As well as a brief history of the Irish working class, it deals with the ICTU’s Better Life For All campaign. At the time most of the left in both Ireland and Britain either enthusiastically supported that campaign (e.g. The Workers Party and Militant Tendency) or dismissed it out of hand as ‘pro-imperialist’ (most trotskyist and republican groups). The LCG’s view was that it was well-intentioned but totally impractical because of the large amounts of capital it would require from the British state to address the economic inequalities that underpinned sectarianism. They also pointed out that there was no point in lobbying the unionist ruling class to get rid of sectarianism as they “would thereby lose their source of strength”. The promised follow-up articles never appeared as the LCG decided to disband and join Big Flame. BF described themselves as “a revolutionary socialist feminist organisation with a working-class orientation”. The name ‘Big Flame’ came from a 1969 BBC television play, The Big Flame, written by Jim Allen and directed by Ken Loach, about a fictional strike in the Liverpool Docks.